_ Dr. Christian Bluth, Project Manager, Bertelsmann Stiftung. Berlin, 17 August 2016. Never since the end of the Cold War have tensions between Russia and the EU been higher. But no side is gaining from increased confrontation – it is, in fact, detrimental to both sides. Instead, increased trade between the EU and the Eurasian region has not only the potential for substantial economic gains, it can also help to build a more stable and peaceful security environment. During their July meeting, the EU heads of government confirmed the sanctions against Russia, imposed after the annexation of Crimea. Yet, the tone some politicians strike is changing. Politicians such as Angela Merkel or Matteo Renzi have indicated their readiness not only to lift sanctions but to engage in closer economic cooperation with Russia and other Eurasian countries. The prerequisite for this is that the Minsk peace process – intended to de-escalate the conflict between Ukraine and pro-Russian rebels – is gaining traction. Russia plays a decisive role in this process and the perspective of increased trade can be perceived as a further incentive to use this role more actively. Once this has been achieved, it would make sense to put the relationship between Russia, its Eurasian neighbours and the EU on a new footing. The present confrontational climate is benefitting neither Russia, nor the EU. The renowned security expert and head of the Munich security conference, Wolfgang Ischinger fears that further demonstrations of strength could spark actual military confrontation. He argues that a strategy of only deterring Russia is not sufficient, a second pillar of de-escalation and rebuilding cooperation is required. A new trade relationship could do exactly this. In the past, trade policies were designed in a confrontational way, thus leading to the mounting of tensions. The aim of a new trade policy should be to overcome divisions rather than reinforcing them. Over the last years, the EU has used free trade areas as part of their Eastern Neighbourhood Policy, aiming at creating friendly relationships with the countries surrounding the EU. While this policy was not directed against Russia, Russia felt marginalised by the Neighbourhood Policy and was weary of losing market shares in countries with which it traditionally had strong trade links. Russia’s response was twofold: The first pillar war to create a Eurasian Economic Union with some of its partner countries. This is a free trade area, also aiming at achieving a high degree of harmonisation in key economic areas. Presently, other than Russia, Armenia, Belarus, Kazakhstan and Kyrgyzstan are members. The second pillar was a free trade area between the Eurasian Economic Union and the EU. President Putin first proposed this during a state visit in 2001, coining the expression of a free trade area from Lisbon to Vladivostok. However, no concrete steps were taken to put such a free trade area in motion. On the contrary, the two different trading blocs began to clash. Since membership in the Eurasian Economic Union and having a free trade agreement with the EU were mutually exclusive, conflicts arose. The largest conflict was the one between Russia and Ukraine, once the pro-Russian government decided not to implement the readily negotiated free trade area with the EU. This provoked public outrage and an overthrow of the government – eventually leading to the conflict at the origin of the disruption of trade relationships between the EU and Russia and the introduction of a system of economic sanctions. Also Armenia had completed negotiations with the EU on a free trade agreement and decided not to implement it, in order to preserve the good relationship it enjoys with Russia. Trade is not only beneficial economically. As researchers in international relations, such as M. Jackson of Stanford University, have shown, increased trade helps to prevent conflicts from escalating. This is because firstly it brings people together, thus facilitating cultural exchange and a better mutual understanding and secondly, it creates strong economic disincentives to disrupt trade ties. These positive effects should be exploited to replace confrontation with cooperation. If the rivalry between the Eurasian Economic Union and the EU Neighbourhood Policy ceased to exist, this could contribute to a de-escalation of tensions. Russia would not need to fear being marginalised, as it would enjoy the same market access as it currently has – and further market access to the EU market in addition to it. It would also be hugely beneficial to countries in Russia’s periphery, especially Belarus and Armenia, who due to their geographic location would benefit most from being part of both trading blocs. Nobody would lose from a free trade area from Lisbon to Vladivostok. The economic gains would be even larger if additional countries from the Eurasian region beyond the Eurasian Economic Union were to be included. As a study the GED team recently commissioned from the ifo Institut shows, the expected growth potential of a free trade area between the EAEU and the EU is substantial. These computations are based on the year 2011, preceding the economic sanctions. The actual effects can thus be expected to be even higher than the ones presented here. 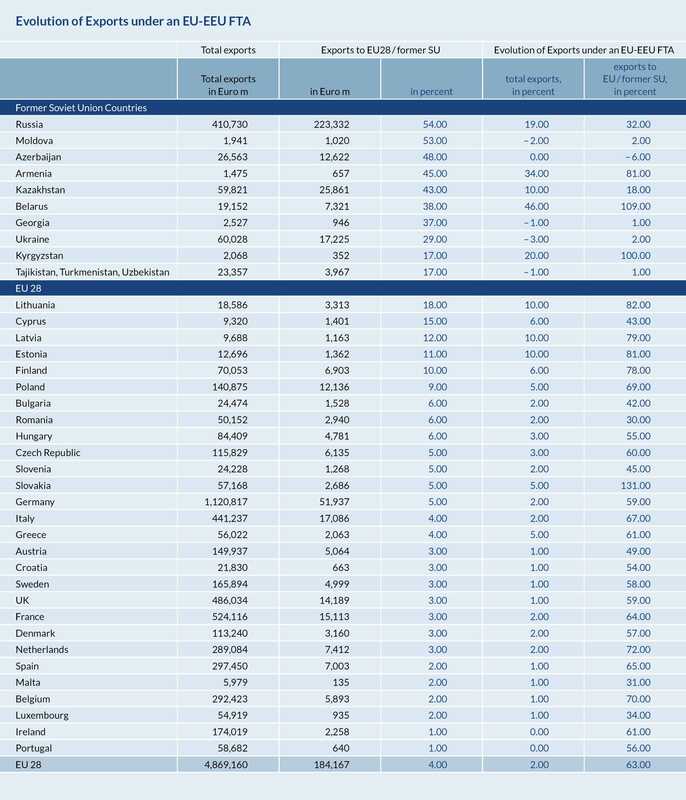 In the case of a deep agreement, Russia’s exports to the EU would grow by about 32 percent in comparison to 2011, Armenia’s by more than 80 percent and those of Belarus and Kyrgyzstan would double. The EU would also benefit: Its total exports to EAEU countries would rise by about 60 percent, with the growth potential being highest in Slovakia, Finland and Poland. German exports would rise by about 59 percent. 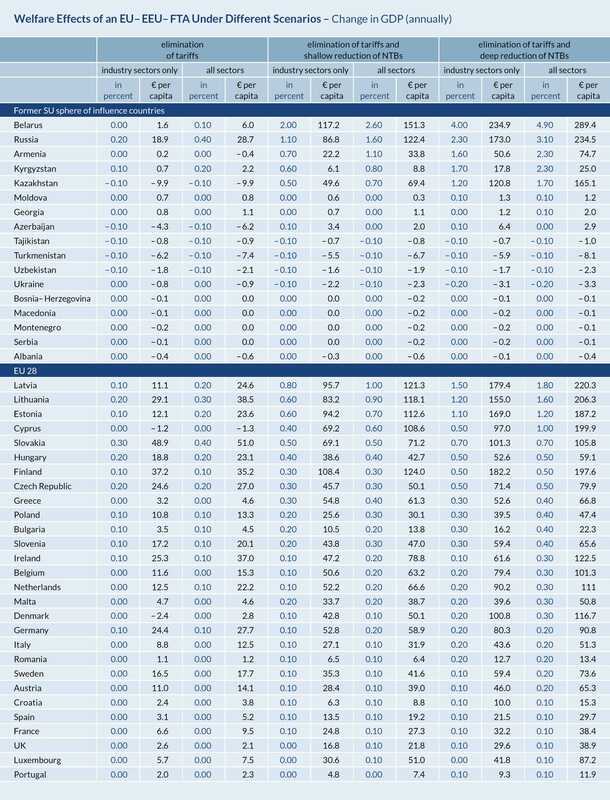 Should a potential free trade area comprise more than just the EAEU countries and also include some other countries from the former Soviet sphere of influence, the positive effects would be even greater, as can be seen in Table 1 and 5. In terms of income per capita, a deep EAEU-EU trade agreement would raise Russia’s real annual income by 3.1 percent or €34 billion. Belarus would profit even more, with an income rise of 4.9 percent and also the growth effects in the other EAEU countries would be positive and significant. 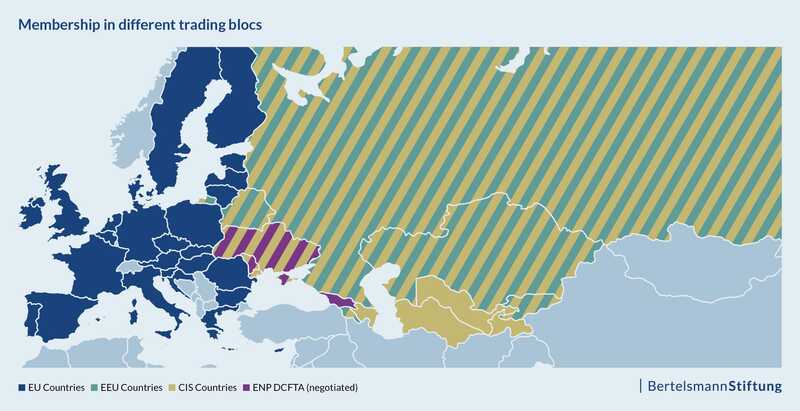 Should other CIS countries not be included in such a trade deal, an EAEU-EU trade deal would have slight negative consequences for them because of trade diversion effects. In Europe, the Baltic countries stand to gain most, with per-capital income rises of 1.2 to 1.8 percent, which corresponds to 200 Euros per capita. The EU as a whole would increase its real income by ca. €30 billion. Germany could expect a rise between seven and nine percent, which corresponds to €90-110 per capita. Even a shallow trade agreement would still generate substantial positive effects. The welfare effects are presented in Table 5. A free trade area between the EU and the Eurasian region has considerable potential. It would help to overcome the divisions of the past and its prospect alone could provide leverage to accelerate the peace project in Ukraine. Once implemented, it would lead to significant rise in exports from both sides, thus making the populations especially of the Eurasian countries much better off. Also the EU would gain economically, especially the central and eastern European countries. Most important, however, is the additional stability and the de-escalation of tensions that such an economic cooperation would bring. A free trade area between the EU and the Eurasian region would indeed be a tool for more peace and prosperity.